In this area of the fashion brand directory, you will find women's fashion brands from leading apparel companies and fashion designers. 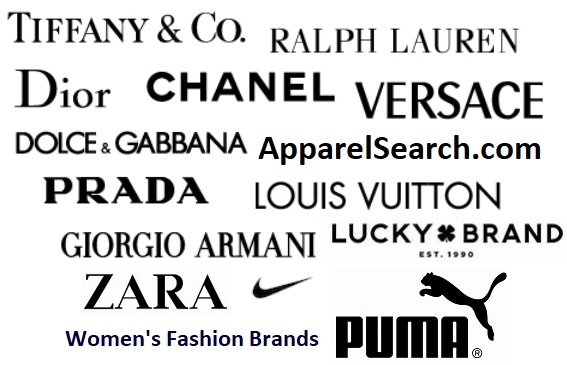 Some of the brands, are international and others are primarily domestic. When browsing this directory, you will find a great deal of trendy new clothing brands that are on the road to becoming the hottest fashion labels in the world of fashion. You will also find popular brands that have already made their mark on the world of fashion. A brand is a name, term, design, symbol, or other feature that distinguishes an organization or product from its rivals in the eyes of the customer. Brands are obviously used in the fashion industry. They are used on garment labels, marketing materials, advertising, etc. Clothing companies often use words or logos to help identify their product. In addition to the garment label, brand names and logos are often printed or embroidered directly on to clothing, shoes, or accessories. They are even marked on zipper pulls, buttons, hangtags, etc. Developing a popular brand is hugely important in the fashion industry. The womenswear market has many famous as well as emerging labels. Those of you that prefer to search by clothing category and not by a specific clothing brand, you are welcome to try our Clothes Guide. What brands are getting celebrity endorsements this season? Learn more about celebrity style including women's clothing, shoes, dresses, boots, bags and more in our fashion celebrities section. Ready to learn about the next big thing? Find current and future trends.